Horseradish oil is an extract from the horseradish root. A lot of people are familiar with horseradish root as a spicy condiment used in a lot of dishes. There are several benefits associated with the use of this root. It is effective in lowering blood pressure, helps in building strong bones, promoting heart health and weight loss and a lot more. It also helps in strengthening and improving the immune system with its rich concentration of Vitamin C.
The horseradish originated from Southern and Eastern Europe but is now cultivated all over the world. It was first discovered in 1500 BC. It is a yellow root crop that grows deep into the ground and grows to as long as half a meter. It is sometimes called Mountain Radish, Great Raifort, Cochlearia or Red Cole. It is recognizable by its dark green leaves, which are large and rough and white cross-shaped flowers. The root is edible and very potent. In this century, it is recognized by doctors Mme. Maury, Cazin and Leclerc as an effective stimulant for gastric functions and for the treatment of chronic and lymphatic rheumatic conditions. Horseradish oil is steam-distilled from its roots. It appears as a pale yellow liquid that is not too watery. It smells like hot mustard seed oil. The horseradish root is pungent on its outer parts, which immediately disappear when it is grated and cooked. Horseradish Essential Oil for Cold and Flu Treatment. The oil is great to use for those dealing with cough, cold and bronchitis. Due to its harshness, the horseradish oil must not be ingested internally and only the diluted amount must be used thru aromatherapy or externally. Put a few drops of the horseradish oil in a humidifier or diffuser and allow it to fill the room to relieve your cough and congestion issues. Once you breathe in the aroma, it will clear your lungs and other issues associated with asthma and bronchitis. Horseradish Essential Oil as a Hair Treatment. Horseradish oil could also be used externally as a hair treatment. With its natural stimulant qualities, the oil is used to help rectify and condition the scalp. It’s a great help for people dealing with baldness. Mix a few drops of horseradish oil with grape-seed oil, olive oil or avocado oil to obtain the best effect. Make sure you dilute horseradish oil with a sufficient amount of other oils because it is very potent. The horseradish root or plant is ideal to incorporate into your diet if you want to achieve positive improvements. The oil is also beneficial when added to beauty regimens and aromatherapy routines. Horseradish Essential Oil as Aromatherapy. Place a few drops of Horseradish Essential Oil in a diffuser together with ample amounts of water and allow it to steam up the room. It provides an aromatic odor that relieves stress therefore lowers blood pressure, enhancing your immune system and promotes overall good health. It also helps clear up any bacteria in the air. The oil contains allyl isothiocyanate making it very toxic. It should only be used externally and diluted for aromatherapy purposes. Internal use must be avoided at all costs and it must not be applied directly on the skin. People with history of allergies should avoid using it. People who have sensitive skin could have allergic reactions. People with Kidney problems must avoid using it. Horseradish oil can be very effective to use in treating a lot of ailments. It contains the main ingredient sinigrin, a gly-coside that when mixed with water creates the mustard oils or isothiocyanates. It also contains isothiocyanates, butyl and allyl. Due to its high potency, it must be diluted with other oils or liquids before it can be applied directly to areas where there are pain and insect bites. It could also be used in a diffuser. In most applications, the oil-rich root is processed or cooked mixed with other ingredients to obtain the full potency of its oil. For the hair. Horseradish Essential Oil is a wonderful stimulant. It provides an excellent remedy if hair has lost its luster. Combine 30 drops of horseradish oil with 10 ml or 2 tsp of soya oil, 40 mil or 1 ½ fl oz of grape seed oil and 2 drops of wheat germ oil. Apply this to the scalp and massage using your fingertips. Leave it on your scalp for a few hours before washing off using a mild shampoo. As a tonic for aches, pains and rheumatic conditions. Boil around 15 to 30 grams of the peeled and chopped horseradish in 1 liter of mineral water for 7 to 10 minutes. Leave this covered in a dark and cool place to macerate for 24 hours. Then drink 2 to 3 cups of the liquid every day between meals mixed with a little honey. As a gum paste. To treat receding gums and inflammations, it is recommended to eat the fleshy root slowly. An alternative would be to rub it as a paste on your gums. Slice thin pieces of the root and mix with peeled dogwood shoots. Mash them together finely into a paste and rub on your gums. 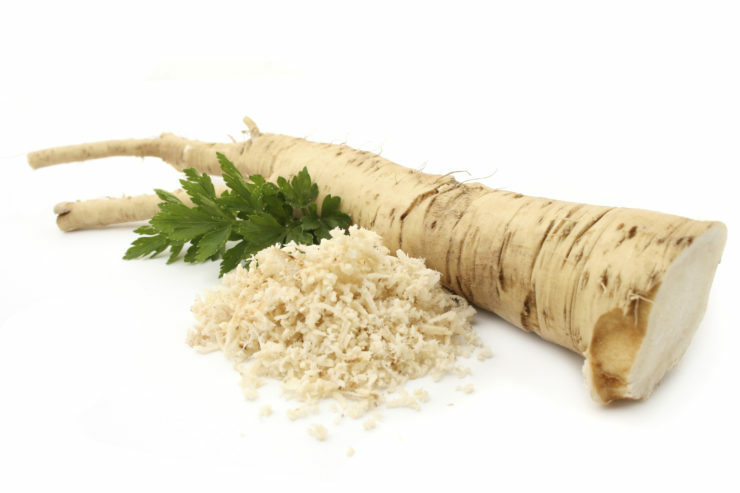 The horseradish extract must be created in small batches using the fresh roots. The freshly harvested roots must me cut or grazed to release the enzymes that produce its distinctive pungency. It must be hand-shaken every day to create an extract that has a strong, pungent and earthy flavor. Peel horseradish root and cut into small pieces. Drop into the food processor a few at a time until everything is finely grounded. Mix the olive and vegetable oils in the machine and while running, pour it slowly into the fee tube in a slow stream. Add the salt and lemon juice. Place the horseradish oil in a jar covering it tightly. Refrigerate for 8 hours or overnight. Using a strainer, line it with a damp cheesecloth. Place it over a bowl and pour the contents into the strainer. Refrigerate the strainer and bowl for 4 hours to allow the oil to drain into the bowl. Discard the strainer’s contents. Place the oil in a tightly covered jar and refrigerate for up to 2 weeks. Return the oil to room temperature before using. Makes up to ¾ cup. Though horseradish oil is toxic when ingested in its purest form, it can be mixed with other ingredients to make it more palatable and beneficial. Here is a recipe concocted by doctor Marguerite Maury for the cure of digestive problems. Boil 1 liter or 1-¾ pints of good quality white wine together with 400 grams or 14 oz of fructose for a few minutes. Add 30 to 50 grams or 1 to 2 oz of peeled horseradish cut into small pieces. Place the mixture in a bottle and store in a dark place for 2 to 3 weeks. Shake the bottle occasionally. During winter, drink 30 ml or 2 tbsp a few times a day to prevent colds and cough. Take 15 ml or 1 tbsp of the wine mixed with mineral water before meals if you are experiencing pre-menstrual fluid retention. Drink 5 ml or 1 tsp of the wine diluted with a glass of hot water for cases of bad digestion or flatulence. Horseradish Essential Oil can be bought online at websites selling essential oils for aromatherapy. At Alibaba.com, there are wholesale suppliers such as OEM/DOM and Universal Mart, which sell it in bulk. The latter offers Kosher preparation. It can also be bought a local health shops and pharmacies. Horseradish Essential Oil contains allyl isothiocyanate, which makes it toxic. It should be diluted before use diluted and only for external use in aromatherapy. Its internal use must be avoided at all cost. It must not be applied directly to the skin and could cause inflammation.